UK car manufacturing showed an increasing reliance on overseas exports as the SMMT announced that production levels had fallen for the first time for eight years during 2017. A total of 1,671,166 vehicles emerged from UK car plants during the twelve month period – a 3% decline on 2016’s 1.72 million – as exports accounted for 79.9% of all production, a decline of just 1.1%. The EU remained the UK’s biggest trading partner, taking more than half (53.9%) of exports, while Japan (+25.4%), China (+19.7%), Canada (+19.5%) and the US (+7%) all emerged as growth export markets. By contrast, the number of vehicles built for the domestic market slumped by 9.8% to 336,628 (2016: 373,255) on the back of a 24.6% fall in production for the domestic market during December. Vehicle production levels fell by 11% during the final month of the year, to 100,604. The SMMT said that the latest figures were approximately 130,000 units below its own mid-year forecast as a result of “lower than expected demand primarily in the domestic market”. Chief executive Mike Hawes said: “The UK automotive industry continues to produce cars that are in strong demand across the world and it’s encouraging to see growth in many markets. “However, we urgently need clarity on the transitional arrangements for Brexit, arrangements which must retain all the current benefits else around 10% of our exports could be threatened overnight. The SMMT also released new figures showing that UK automotive investment fell by 33.7% in 2017. Some £1.1 billion of investment earmarked for vehicle and supply chain manufacturing was publicly announced last year, down from £1.66 billion in 2016. Jaguar Land Rover was the UK’s largest car manufacturer. In 2017, the manufacturer produced 532,107 vehicles, a 2.3% fall from a record high in 2016, at its three plants in Birmingham and Liverpool. It also produced 305,907 clean Ingenium engines in Wolverhampton. 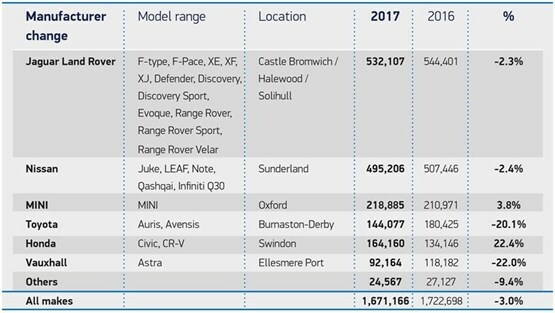 JLR came ahead of Nissan’s 495,206 vehicle 2017 production (down 2.4% on 2016) and the BMW Mini plant’s 218,885 total, which represented a rise of 3.8% on 2016. Vauxhall’s UK car production total saw the biggest slump in production levels in the year that saw the brand acquired by the PSA Group, production levels falling 22% to 92,464. JLR said in a statement that it has invested more than £4 billion on its vehicle and engine plants since 2010, bringing six new models and two Ingenium engines to the market. However, earlier this month it announced that it would be reducing production of its Discovery Sport and Evoque models at its Halewood plant. The move paves the way for the likelihood that JLR’s biggest selling model in 2018 will be an import. JLR’s new E-Pace SUV is being manufactured at the Magna Steyr plant in Austria. 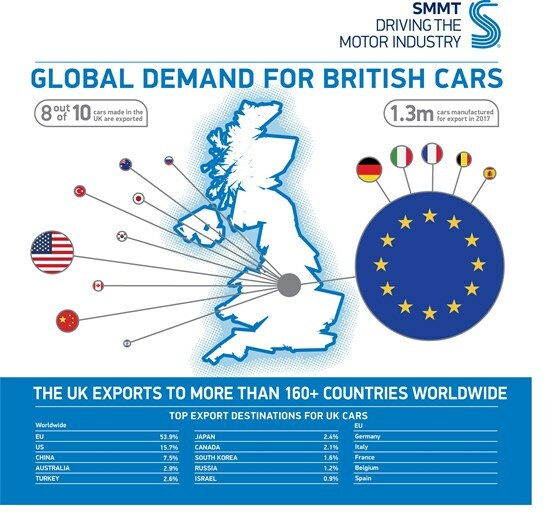 Commenting on the SMMT car manufacturing figures released today, Justin Benson, head of automotive at KPMG in the UK, said that the recent decline in sales should be kept in perspective, having come on the back of "record levels" of car manufacturing over the past few years.